Welcome to the Blog Hop for August. This month we are showing off our favorite crafting tools - those Stampin' Up! tools that we just can't live without. We hope you enjoy our projects! You may just be starting the blog hop or may have come from Mary Fish at Stampin' Pretty, #39 on the Pals Hop. If you get off track at any time, the full lineup below will help you move along from blog to blog so you see all of the amazing creations. My favorite tool... it truly is like choosing the favorite child, they are all dear in their very own way, but let me share some of my most used tools! Today's project is a set of 3 x 3 cards and a coordinating box in which to put them. I know the holiday catalog is much anticipated and many folks are providing sneak peaks, but I'm hanging on to the last days of summer, so I broke out my By the Seashore stamp set for my project. Every card I make starts with the Stampin' Trimmer. SU! has the best cutting tool in town, one that can handle a 12 x 12 piece of CS or DSP with no problem. This wonderful tool can also score your project! A good cutting tool is a must have for every papercrafter. My box was created using the Simply Scored Scoring Tool. The projects you can make with this handy dandy tool are ENDLESS! The companion Simply Scored Diagonal Plate and Simply Scored Borders Plate triple the usefulness of this amazing tool. 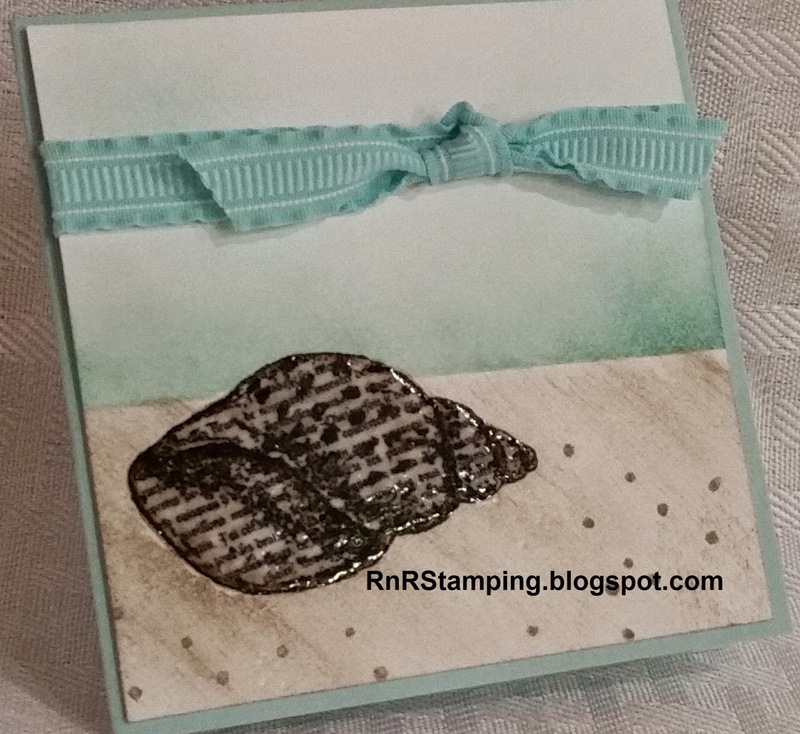 To create my beach scene, I used a post-it note to mask my paper and sponged Crumb Cake on the bottom of the card to create the sand. Next step was to reposition the paper and sponge in the white space with Pool Party. I filled in the horizon line with Coastal Cabana to provide the sea in the landscape. In this photo, you can see the shine on the seashell. I used a technique that is a take off on emboss resist. I stamped my image using Stazon black ink and colored it in using a blender pen, Sahara Sand, Crumb Cake and Soft Suede ink. I then covered the image with Versamark ink, covered that with clear embossing powder and used my heat tool - another favorite! The end product is this shiny effect. For more depth to your project, you can actually layer color on the embossed layer and emboss the image again. For the box, I used another must have tool, the paper snips, to cut out my images and then popped one of the shells up using dimensionals - are they a tool?? Not sure, but I do know they're wonderful!! So, my must have tools? The Stampin' Trimmer, Simply Scored Scoring Tool, the Heat Tool and the Paper Snips. These are basics that should be in the tool kit for every papercrafter! To purchase any of these items, click on the product name and you'll go straight to my 24/7 online store. If you enjoyed learning this technique, please leave a comment. Stop back tomorrow for another sample using this fun technique. The next stop is Beth Beard at My Little Craft Blog, #2 on the Pals Blog Hop! Thanks for visiting and I hope to see you next month. Adorable cards & box, Sue! Great post! Beautiful projects! Woo hoo! Love the card set and box...so cute! I am a sucker for anything nautical or beachy...love the techniques you used especially to create the sunlight on the shell with embossing! Wow, I love this card set! You did the nautical stamp set beautifully. I love it! Very nice project Sue! Wow you are #1 in this blog hop- how cool is that! I love all these tools! Beautiful work! These cards are beautiful..I will have to do some casing! Thanks for sharing! great post. I need to use my scoring plate more - it's an awesome tool! Beautiful Sue! Fantastic example of some great tools! Love the collection. I have never tried this technique and am inspired to give it a try. Beautiful Set - a great way to hang on to summer a little bit longer! Love your by the sea card set, very pretty! Beautiful collection. Perfect sea side colors. Great job, Sue! I agree that the tools you picked are must haves for any crafter. Love the shine from the embossing, too!